Our government security services offer the protection demanded by government assets in the Philadelphia area. Whether your facility needs a dedicated security presence, roving patrol security, or a combination of different services, Signal 88 of Greater Philadelphia is prepared to meet your needs. No matter the job, we’re ready. Our customized security solutions, bolstered by 88 Edge® technology, make us uniquely qualified to meet the government security needs of greater Philadelphia’s federal, state, and municipal institutions. Signal 88 of Greater Philadelphia proudly serves government facilities and institutions throughout the Greater Philadelphia area including Bensalem, King of Prussia, Fort Washington, and Norristown, PA.
Government security services by Signal 88 of Greater Philadelphia can be customized to practically any job and/or facility. We provide security services for all levels of government, for facilities of different sizes and with varying security concerns, and for government events with unique security needs. Our services start with an intensive security assessment, and we create a fully customized security plan for every site we secure. Signal 88 of Greater Philadelphia offers the staff, experience, and technology to cover a range of government security needs. 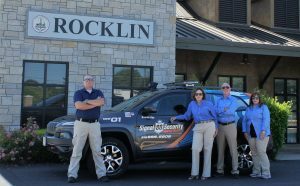 Our roving patrol services provide a highly visible mobile presence, using randomized patrols to deter trespassers and other criminal elements. We also offer dedicated security staff for areas that need a consistent security presence. Whenever necessary, our services can combine roving patrols and dedicated officer services for sites requiring multiple levels of security. Why Signal 88 of Greater Philadelphia? The experience of our leadership team, the training of our officers, and the technology we use in our services make Signal 88 of Greater Philadelphia uniquely prepared for the security needs of government institutions. We are led by Sal DeRose, a US Army veteran and an expert in security services and security assessments. Our staff is made up of highly trained security professionals, including a number of former law enforcement officers. We are committed to preparing our officers for the most pressing and most crucial security issues facing our clients, including those in all levels of government. Government security services by Signal 88 of Greater Philadelphia are backed by 88 Edge technology. This web/mobile-based platform plays a key role in maximizing the effectiveness, efficiency, and protection offered by our security services. Through 88 Edge we can plan security services with unparalleled precision and respond to security concerns as soon as they occur. Contact Signal 88 of Greater Philadelphia for more information on our government security services. Call (610) 489-1890 today for a free consultation.